Workflow Studio is the unique migration, analysis and maintenance tool for AR System applications. 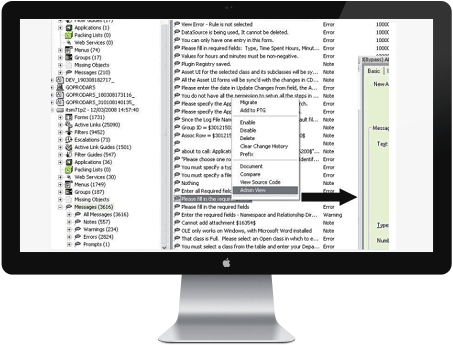 Saves money and development time by automating common manual administration & development tasks. Ensures complex migration procedures are performed correctly and safely every time. Automatically archive or backup your application and data, allow Administrators the possibility of reverting back to previous versions if required and ensuring an audit trail of changes during a project through an automated process. Use the tool to improve efficiency of your Developers & Administrators, thereby lowering the TCO. Lease the product and transfer the investment from Capex to Opex. Often non-technical audiences do not want to get into the details of the workflow they simply want to get an idea of the impact of making changes to parts of an application. Using the Workflow Studio the developer can Graphically represent the application and show how changes planned for development could (or will ) impact the rest of the Application. The Workflow Studio’s unique dependency engine ensures that all objects being migrated are transferred in the correct order. Any data/DSO mappings may also be migrated at the same time as the definitions. Create XML patch files of any development changes (create a patch for a few fields or your whole application). Compare Workflow, Data, CMDB CDM. Create differencing profiles and use them to search for specific differences in any AR System object/attribute between servers. Snapshot/Archive feature enables you to take images or checkpoints of your servers over time and have them available in the single Workflow Studio interface, at the same time as your live servers. View AR System objects in dialogues native to AR System Admin tool. View cross reference relationships instantly in Navigator view and jump between different objects by double clicking on object names displayed in the dialogues. Generate diagrams automatically displaying graphically the relationships and dataflow between Forms in your application. Quickly determine an appropriate indexing strategy for you AR System application. Identify effective/redundant indexing within your application. Document your ARSystem objects to CSV or Word and ensure you always have a copy of your definitions on file in readable format and do not have to waste valuable developer time documenting changes made to the system. If you are interested in support for the Free version this can be purchased on an annual basis for small fee. For access to more than 2 servers, unlimited comparisons and migration / patch release functionality check out the client / server options. Client licenses are tied to a specific user. Independent Consultant or Enterprise Client license available. Server based licensing is ideal for Companies with multiple developers and/or small numbers of servers.